Nicolaas Fourie, an alumnus and an assistant research professor of anthropology, died late last month of an unknown cause. Nicolaas Fourie, an alumnus and an assistant research professor of anthropology, died late last month of an unknown cause. He was 38. Fourie was a lover of life, learning and his family and friends, those close to him said. His wife, Angela, remembered the week before he died, when he spent a snow day fashioning a makeshift jungle gym for their son, Jannie, and chatting with the 1-year-old in Afrikaans, Fourie’s native tongue. Fourie grew up in a rural area near Cape Town, South Africa. 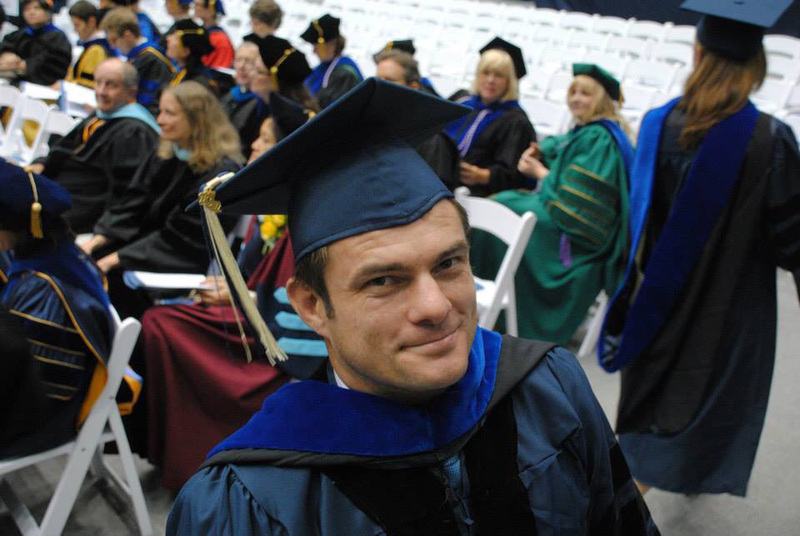 After receiving his bachelor’s and master’s degrees at the University of Cape Town, Fourie moved to D.C. in 2006 to pursue his doctorate in hominid paleobiology at GW. He graduated in 2012 and took on roles at the University of Connecticut, the National Institutes of Health and the pharmaceutical company Allergan before starting at the University as an assistant research professor in April 2017, according to his LinkedIn profile. Angela Fourie said Fourie always had an inherent attraction to nature and the environment. He often walked around barefoot and spent 10 to 15 hours a week during the warmer months of the year tending his family’s garden, she said. Fourie was also a consultant for a National Geographic television show in 2011 about the first humans, and he conducted molecular research on gastrointestinal disease and bacteria, among other topics, as a research fellow at the National Institutes of Health, Angela said. She said her husband’s passion for anthropology and science even translated into the way he was buried. He had always told her that he wanted to be mummified so he could be “found by researchers hundreds of years from now,” she said. “Every tough point at his life, the people in his life and the environment, everything ties back to plants and animals and the mountains,” she said. A private Facebook group dedicated to Fourie, inundated with photos and stories about adventures with him, features posts from 300 members from people all over the world. Two GoFundMe fundraisers to support Angela and Jannie Fourie have raised nearly $8,000 and $57,000, respectively. Friends and colleagues said Fourie’s friendship meant hours of deep conversation and learning about different bird and plant species. Rui Diogo, a professor at Howard University who was friends with Fourie while he pursued his doctorate, said he was an “interdisciplinary” scientist who was fascinated with evolution. He said Fourie defied the stereotype of a scientist holed up conducting research – rather, the late researcher enjoyed going out, talking with people and living his life to the fullest while teaching and learning along the way. Erin Marie Hatala, an associate professor of biology who graduated from the same doctoral program as Fourie, said she fondly called him “The Beast” for his large, muscular body. She said he was a “meticulous” scientist who had a reputation for knowing everyone on campus and partaking in “crazy” habits that made his colleagues laugh, like eating expired food from the GW Deli. Mike Fabling, a director at an information technology management company who played rugby for six years in the Potomac Athletic Club with Fourie while he completed his doctorate, said the late researcher was as “fearless” in rugby as he was in life, resulting in several injuries, including a separated shoulder. Fabling said Fourie had been playing rugby since he was a child, and while he would admit that he wasn’t the most skilled player on the team, he would never hold back and practiced and exercised almost every day of the week. Fourie would try any move in his position as a flanker – no matter how reckless the play – and would think about the consequences later, Fabling said. “Nic was one of those guys who would unquestionably throw himself into harm’s way or into the unknown,” he said. Fabling recalled several times when Fourie would come to his home in Virginia and the two would walk his dogs together. Sometimes, without warning, Fourie would climb a tree – an action indicative of the “little bit of wild in him that would just never go away,” Fabling said. Fourie is survived by his wife Angela, his son Jannie, his sister Hermien Fourie Craven and his parents Jannie and Penny. Two memorial services are being held for Fourie. The first will be held in Paarl, South Africa on Friday, and the second will be held at an undetermined location in the District on April 6 from 1 to 4 p.m. This article appeared in the March 21, 2019 issue of the Hatchet.